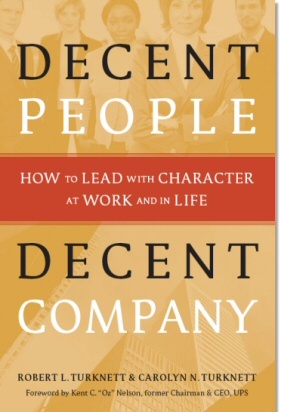 f you want to grow as a leader and as a person, read “Decent People, Decent Company” and put its principles to work. This is a book you will want to give to your associates and reread annually." After reading Decent People, Decent Company, one can’t help but speculate on the dramatic impact this book could have on the careers of so many business people. Few of us take time for a meaningful self-evaluation, identifying the areas where our strengths lie and the areas where we could improve. This book is filled with examples of people who have done just that. They have responded to the challenge to chart a path toward personal improvement and their rewards have been substantial. Building on experience in the private practice of psychology as well as their extensive experience in corporate leadership, Bob and Lyn Turknett have offered a highly readable and instructive lesson on how to create positive leadership at every organizational level. From learning the value of listening, to developing empathy, to demonstrating a belief in the value of every individual, this book offers tools that can augment and accelerate the movement toward organizational, and personal, goals and objectives. Decent People, Decent Company offers advice that works equally well for every employee – from frontline supervisors to CEOs. Drawing on actual experience, Bob and Lyn examine core values that can be translated into more productive and satisfying personal interactions in the workplace. How do we encourage trust? Why is transparence important? What is the role of integrity even in the little things? How do we relate an environment that allows for freedom of expression, disagreements and even challenges to the propriety of proposed actions? In my forty-three years at United Parcel Service, we grew to understand that the seeds of trust, respect, service excellence and personal responsibility must be sown at all levels of the organization. We also grew to understand that those seeds required constant tending and nurture in order to thrive. The Turknetts tell us the same is true of any company’s core values. Without constant care they will wither and die. This book offers every employee in every organization the opportunity to meet their responsibility to be an effective leader.